Hey Nokia please fix the front camera with upcoming update as front is not at all good in high lights like sunlight and flouroscent lights as it has over exposure and not proper contrast. 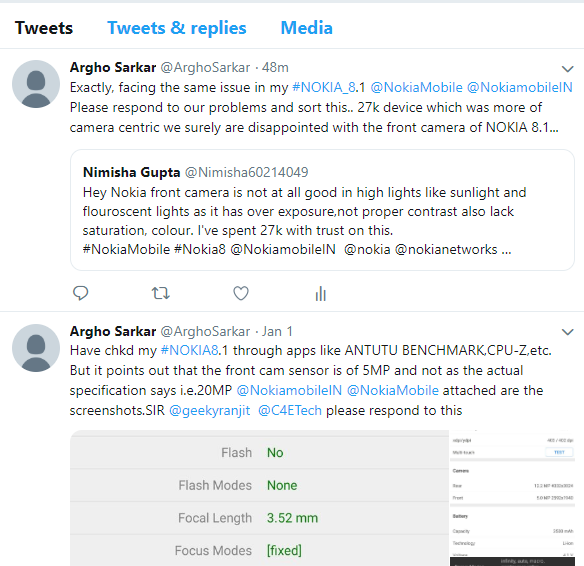 Hey Nokia please fix the front camera with upcoming update as front is not at all good in high lights like sunlight and flouroscent lights as it has over exposure and not proper contrast. I bought your recent released phone with trust please dontd break it. Please fix it as soon as possible I'm selfie person. And it's daily part of our life. @nimisha gupta then you have only one way remaining until get camera updates i.e.Either Use GCAM or Take Selfie/Photos From Rear😔. @nitin kachare Would you mind sharing the link for GCam here?? Otherwise where I could find that?? @nitin kachare Gcam I had downloaded but this device is not supporting as it is not available on play store I had downloaded APK one and I tried many other version also but couldn't get any help. Are you facing same issue with front camera? If Google Motion On Then Set Off. click on Google Camera it will download. Hi, I've downloaded GCam with the link given above. Basically, the link has to be copied separately and try in GChrome Browser for a successful download. Once downloaded, You have to Enable allow from source permission for installation. It won't download properly if you directly open with Support app browser itself also you'll end up seeing pop-ups. @Narayanan.R are you using 8.1? I don't have an 8.1 but I do use a 7.1 amongst a few other Nokia phones. The 7.1 from camera isn't great either so I use open camera from the Google store , if you activate camera2 API in the option screen it unlocks more features like being able to customise or turn off the amount on noise reduction. You can find the difference with GCam when u are capturing something in very low light situation here GCam plays a vital role in adding enough light through software algorithm. Are u downloaded from Same Link Which I have given.Copy paste Given Link In Google Chrome It will not open properly in support application.Anyway I am waiting for Security Patch Of January Because We can expect any update i.e. Bug Fixes or Maintainance Release with come with monthly security patches. @nitin kachare I really hope this front camera issue will be resolve. We all have spend 27k just to wait for this camera issue. Not at all satisfy with front camera. But other than this is all good. But only focus to buy this camera and hate waiting. @nitin kachare @Argho Sarkar @Narayanan.R if you people notice that front camera also have some colour issues like less saturation and contrast and more exposure with subject too. I compared with my previous images. They really need to fix this otherwise ill have to oftend them. I am selfie lover n couldn't wait. It doesnt look like 20 mp camera I don't why but the image doesn't have that quality maybe colour issue n of course exposure one. @mehtasameer2087 yes I read it. @Argho Sarkar good, we all have to do it together otherwise they won't listen. And people want to share something that when I called Nokia costumer care, she asked the complaint reference no. I said that when I had conversation they hadn't given me any but this time I ask to register the issue and asked for complaint reference no. It has two things that 1. We have proof and another one that as many as register complaint nos. They have, they urge to take action soonest. @nimisha gupta Why did you tag me? I've not been involved in this discussion and I'm not HMD staff, I'm just a community member like you. I have no additional ability to fix this or get HMD's attention than you do. You've also tagged many other community members who are in the same position as me. Please be considerate when you tag people, you''re more likely to get help. It sounds like the firmware for the front camera on the 8.1 isn't tuned correctly. Do you only get this problem with the camera in Auto mode or also when manually adjusting settings in Pro mode? Note that the front camera uses a very different algorithm from the rear camera. The rear camera is a really good smartphone camera, good optics combined with a good sensor. The front camera uses a different approach - oversampling - to use multiple sensor pixels to produce a single image pixel; both its sensor and optics are much poorer than the rear camera.